Standard Lightning Series | Stealth Products, LLC. The standard Lightning series comes in three different sizes (11", 14" and 16") and two different upholstery color options (Red Glow or Navy Blue). 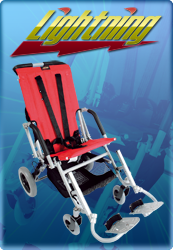 The 11" Lightning frame weighs only 25 lbs., it's able to fold up making it easy to transport, and can support up to 75 lbs. The Lightning's seat and back angle are adjustable to accommodate your client's unique comfort needs. For function, performance, and durability in a beautiful package, the Lightning is a strikingly bright choice! The 14" Lightning frame weighs only 27 lbs., it's able to fold up making it easy to transport, and can support up to 100 lbs. The Lightning's seat and back angle are adjustable to accommodate your client's unique comfort needs. For function, performance, and durability in a beautiful package, the Lightning is a strikingly bright choice! 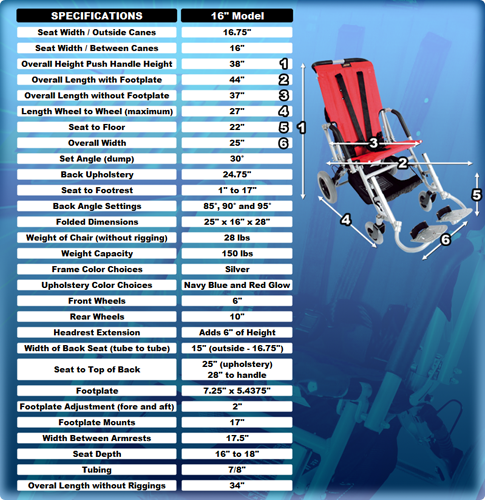 The 16" Lightning frame weighs only 28 lbs., it's able to fold up making it easy to transport, and can support up to 150 lbs. The Lightning's seat and back angle are adjustable to accommodate your client's unique comfort needs. For function, performance, and durability in a beautiful package, the Lightning is a strikingly bright choice! 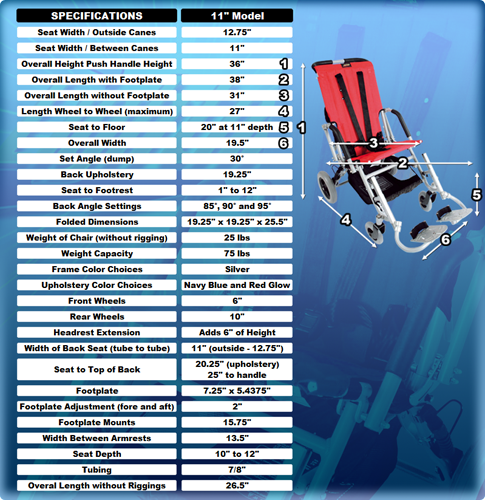 Seat Width / Between Canes 11" 14" 16"
Overall Height with Push Handle 36" 36" 38"
Overall Length With Footplate 38" 42" 44"
Overall Length without Footplate 31" 35" 37"
Length Wheel to Wheel (maximum) 27" 27" 27"
Seat to floor 20" at 11" depth 21" at 14" depth 22"
Overall Width 19.5" 24" 25"
Seat to Footrest 1" to 12" 1" to 17" 1" to 17"
Folded Dimensions 19.25" x 19.25" x 25.5" 24" x 19.25" x 27.5" 25" x 16" x 28"
Front Wheels 6" 6" 6"
Rear Wheels 10" 10" 10"
Footplate 7.25" x 5.4375" 7.25" x 5.4375" 7.25" x 5.4375"
Footplate Adjustment (fore and aft) 2" 2" 2"
Footplate Mounts 15.75" 16" 17"
Width Between Armrests 13.5" 16.25" 17.5"
Seat Depth 10" to 12: 12" to 14" 16" to 18"
Overall Length without Riggings 26.5" 29.5" 34"